200 x 200 Denier Oxford Nylon with 1/4 oz Urethane Coating. 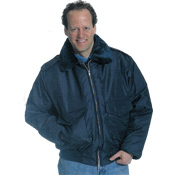 Features a security style bomber jacket with epaulettes. The lining is made with nylon satin quilted to 6oz/yd. Dacron Hollofil.